Well, it’s an even year this decade and that means the San Francisco Giants are guaranteed to win the World Series, right? Maybe. That’s exactly what they did in ’10, ’12 and ’14. And given that their fourth and fifth starters are guys like Jake Peavy and Matt Cain, I’m not going to be the one to say it’s not possible. The Giants sure looked like champions during the first game of this third series, as offseason addition Jeff Samardzija looked comfortable back in the Bay Area after an off year in Chicago. Thankfully, though, the Rockies were able to fight back against both Peavy and Cain in games two and three and take the series. And any which way you want to splice it, this is a series Rockies fans should be proud of. There is nothing to report here. Samardzija was just better than everyone else. He made Coors Field look like a home game for the Giants. Both teams flipped the script in game two, as the starters were nowhere to be found. Peavy gave up nine extra base hits in just over three innings, and Lyles didn’t even make it five innings, giving up five earned runs, continuing a poor start to the season. 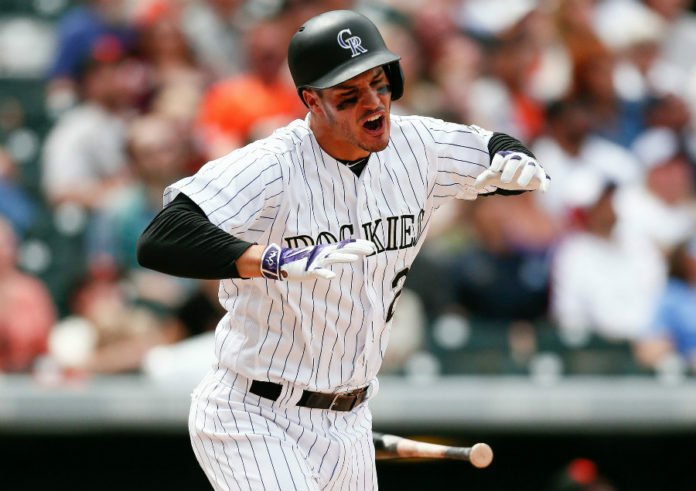 Thankfully Nolan Arenado’s bat went into hyperdrive, recording a career-high seven RBIs. Trevor Story was also the first player to ever be robbed by the new fences in right, as his eighth and ninth home runs turned into triples. But while some may be echoing Reagan to “Tear down that wall!” there are much bigger issues for Story. Samardzija seemed to find the formula for getting the young shortstop — throwing moving fastballs outside the strike zone — and the rest of the Giants staff executed it continuously, striking Story out seven times in the series. He almost looked like his teammate, Mark Reynolds, over at first base: a promising talent with a ton of pop that comes with a ton of strikeouts. Look for future pitchers to take this approach. What got lost in all of the offense, though, was the performance by Chris Rusin. He went 2 1/3 innings without giving up a hit. This was in a critical spot in the game where the Giants were threatening to comeback. 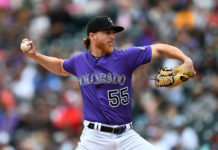 This was easily the best performance by a Rockies reliever this year and a great rebound for him after his appearance against the Padres, where he gave up three runs. The biggest story in the series came with the announcement that Charlie Blackmon was placed on the 15-day disabled list with turf toe. While this might seem minor, Blackmon suffered from the same injury in 2013, where he wasn’t able to consistently stay in the majors. This comes after game two, where he hit a double and a triple. While the center fielder is batting just .185, the outs he has recorded have been struck with authority. Those balls will eventually land for “The Outfield” heartthrob, and hopefully this is just a precautionary move and not a reflection on his batting average; it’s way too early for a move like that, and this team is much better with Blackmon leading off. While Ryan Rayburn will probably fill in for Blackmon, it would be nice to see what the team could get out of Brandon Barnes. With Lyles struggling, the team must get something in return for the Dexter Fowler trade. Is it too late for Corey Dickerson to come back? Now, getting into the game: While nine runs in the fifth inning was the easy takeaway, this was De La Rosa’s best start by far. He was able to cut his ERA by nearly four runs and was able to battle adversity, something he has not shown in either start this season. Historically, De La Rosa struggles in the fourth and fifth innings, and this game was no exception. In what should have been an easy double play with the slow Buster Posey on the base paths, De La Rosa made his second error of the afternoon to load the bases. He then threw a wild pitch to score the game’s first run. But then, De La Rosa proved why he is this franchise’s best pitcher ever: he limited the damage to one run in that inning and gave his bullpen a much needed break by pitching into the seventh and striking out seven. Tack on two singles and a couple of RBI’s to help himself, and this is the De La Rosa we’ve been waiting to see. 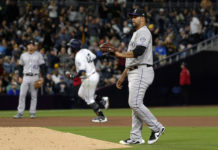 If the team can rake against the Giants, it is difficult to understand why the Padres handled the Rockies so easily. One day this team will play consistently.